Miles Perrine was born in Strange Creek, VA (WV) on 15 APR 1831. He died on 18 NOV 1885 in Spencer, WV and is buried in the Spencer Memorial Cemetery, Spencer, WV. 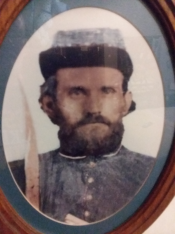 Assigned to CPT William F. Pell Co. 193rd Virginia (WV) Militia. Submitted by Jeff Garten - Thanks, Jeff!